Revel POS was founded in 2010 by Lisa Falzone and Chris Ciabarra. It is a modern, user-friendly Apple iPad POS. This POS solution began beta testing in the fall of 2011 with a number of Bay Area businesses. Since then, it has quickly attracted the attention of early-stage venture capital fund DCM. 15 Is Revel POS System Right for Your Business? At present, Revel has hundreds of employees and international offices in Italy, Australia, England, and Lithuania. The company has over 25,000 terminals that are in active service. Thus, it has built a solid reputation as a stable and reliable POS provider. Their clients include Smoothie King and Goodwill, but they have plenty to offer small and medium-sized businesses as well. Revel has an edge over the competition thanks to its ever-expanding features, services, and integrations. 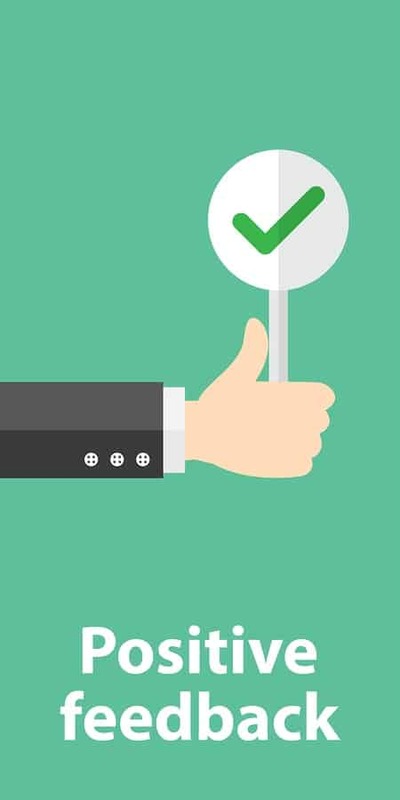 Some of the best ones include offline functionality mode, remote support, a partnership with QuickBooks Integration, and an intelligent reporting suite. Revel’s prices depend on the setup and industry of the client. The company offers industry-specific software packages for a fixed amount per month. The good news is that the subscription includes a software license. The industries where Revel integrates well range from retailers and restaurants to smaller-scale food trucks and ice cream shops. Pricing is flexible and it breaks down per terminal. The company has also begun offering Revel as a Service (RaaS) pricing, which includes a minimal upfront fee. With RaaS, clients pay a small sum every month that covers the monthly hosting charges. The replacement of malfunctioning or defective hardware is absolutely free. Each subscription package includes unlimited data storage and software updates, 24/7 live support and QuickBooks integration. Revel’s POS is both web-based and locally installed. You can run it locally through your Apple iPad and sync all data to the cloud. Even if you lose Internet access, the POS will continue to function. Payment authorization for credit cards may not be possible while the Internet is down, so it can be risky to accept card payments offline. Revel works particularly well with quick service businesses and restaurants, and that’s why many of their integrations target these two industries. The software’s popularity has been constantly growing, and it is now a viable solution for salons, retail and mobile businesses, grocery stores, pizza and coffee shops, as well as niche shops. On the whole, Revel has adapted its software to encompass almost every industry. Still, the system’s customization according to your specific preferences may take some time. Revel Systems works best for large businesses. This because it can manage up to 500,000 SKUs and multiple locations. This versatile and flexible POS solution is also good for mid-sized businesses, especially those struggling to compete with their larger rivals. It offers plenty of applications and modular software that allow the user to customize the system to their needs. Because the system is so flexible and allows so much customization, its initial setup can be both time and energy consuming. This is why Revel may not be suitable for a relatively small business. Chances are that small retailers will not be able to take full advantage of the system’s advanced features. Once you manage to get it going, the software is relatively easy to use. The back end is clarified by a series of training videos, and the front end is very intuitive and easy to navigate. Revel’s user friendly system will also make your staff more productive and give them the confidence they need to fulfill their job requirements quickly and efficiently. Revel requires employees to log in with a pin number to access permissions and unique settings. A touch screen displays a product matrix on one side and order tallies on the other. Descriptions are optional. Amounts and modifiers are easy to add, as are discounts and additional payment options. Among other things, you can use Revel POS as a customer-facing display, or a kiosk. Revel’s design presupposes easy navigation through everything from staff to inventory management. At the same time, you should allocate some business hours and resources for proper staff training. For instance, it takes some time to learn how to use the advanced functions, or even get to know how the system operates in general. Owning and running a business is not easy. Therefore, get armed with patience and perseverance, if you really want to integrate this fairly complex POS system into your business. Fortunately, most of the basic functions are pretty easy to navigate and use. For instance, exporting data is a piece of cake. It is also easy to manage an employee’s permissions. Last but not least, you can add, modify or remove items directly from the dashboard. Revel is mostly compatible with Apple iOS devices (iPad Pro, Mini 3 and 4, Air and iPad Air 2). The system features full hardware bundles and will work with almost all bar code scanners. You don’t have to buy the hardware from Revel. Yet, we do recommend checking their pre-configured hardware list on the website to make sure the equipment you get will actually work with the system. Adding and managing inventory is very simple – all you need is an item and price. Other fields, such as SKU and cost, are available as well. A style matrix is available for simple mass entry of inventory items that differ only slightly and only by color, size, or style. Moreover, you can use a template to import inventory. The system can track inventory per ingredient. On the ingredient level, food cost reports are also available. Low stock items show up in red on your inventory page with cool reorder buttons. Revel can even cope with retail fuel sales with wet stock management. Cashiers can tap on menu categories with modifiers and drop-downs of items to select. They can also enter bar codes into the system so as to scan items. Multiple tax rates, surcharges, discounts, and service fees add automatically or manually at the time of sale. Cashiers can set orders to-go, repeat items, for delivery, enter discounts, remove items, enter special requests, and add quantities in the “edit item” screen. 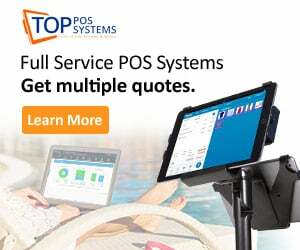 Naturally, the POS can also void payments, split bills, allow for tips, print/reprint guest receipts, email receipts, and enter rewards card numbers. You can go back to an order that has been sent to the kitchen and add additional items, sending only the newly added items to the kitchen. Of course, items that have already been sent cannot be edited or deleted. They can be discounted, repeated, voided or increased in quantity. The Revel QuickBooks Integration transfers data from the system to QuickBooks accounts automatically. This helps streamline the bookkeeping process and sync sales, purchase order, inventory, and accounting data into QuickBooks Online. 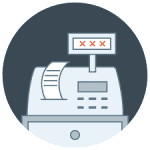 Users can see total sales, discounts, and refunds created on the Revel POS because sales summary information is transferred to QuickBooks each day. Employee schedule and payroll information is also sent to QuickBooks, as well as purchase order and inventory adjustments. Revel updates sync automatically. For the setup, the system will need to do some mapping to synchronize your data. Revel can not only create POS and associate inventory with vendors, but also help you manage when stock items come and are added to your inventory. If vendors only send you a portion of your stock, you can notate partial orders and finalize orders once the order is complete. All cash management functions are conveniently stored under the manager selection of the settings tab: over/under till, batch processing, and printable quick-view reports like total credit, cash, check or gift certificate for the night, time management and items sold. Each staff member has his or her own unique and secure swipe card or PIN-activated login, which enables you to track time, employee activity and performance within the system. With Revel you can create employee reports on the basis of sales volume, number of discounts and voids, and productivity. You can customize access parameters per employee responsibilities. Revel can also handle employee time scheduling. The system tracks customer purchases as well as all required customer information such as name, phone number, address, and email. You can export and use this info to create mass marketing campaigns or cross-sell other stock. It is even possible to customize table reservations by adding customer preferences and send text notifications as soon as the customer’s table is ready. Revel has some creative features to make ordering easier, including tableside ordering, the already mentioned customer facing displays and mobile and online ordering. Most recently, Revel added the option to play a video on the customer facing display whenever it is idle. Entering payment or sending an order over iPad transmits the information to the kitchen display system. This way servers can see if an order is in progress or completed. The kitchen view will display the order plus any changes, the time it came in, the name of the server, the name of the customer name, and the status of the order (whether it has been completed or not). The server touches “completed” in expedite view and clears the order off the screen once the food is taken out. 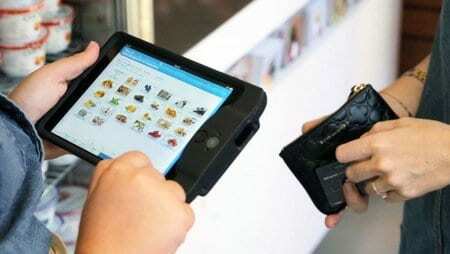 Customers can place their order and pay all on their own using the iPad POS as a kiosk. They can browse menus, place orders with their name or select or edit items and quantities. Orders can be completed by paying cash or with credit, debit, or gift card. Revel is integrated with digital menu boards - the system and your menu displays can exchange data and communicate. Your digital display updates whenever you update your menu in the Revel POS. Revel’s software, hardware, and network are all PCI-DSS compliant. Sensitive credit card information is always encrypted. The company’s data centers are PCI compliant and SAS 70 Type II certified. All data is regularly backed up, and single location businesses have their own database. This system features pretty extensive reports, which are easy to read. Some of the dozens of reports available include sales summaries, transaction details, ingredients sold, available/used gift cards. The list goes on wit PLU report, total credit transactions, total voids, percentage of labor against sales, refunded/exchanged items, and employee check out report. With real-time tracking, you get instant access to sales, staff, and location data. You can export all the data you need. Multi-Store Functionality – Revel is capable of handling a franchise, or a single store. Revel POS offers a card-less loyalty program, among other integrations. Their add-ons include e-commerce, online and mobile ordering. Revel also provides integration with Shopify, Kosmos Central, Open Dining, Zuppler and Chowly. The other functions of this POS system include employee management, DTT, Homebase, Deputy and mobile payment processors. Revel supports the following mobile forms of payment: via Apple Pay, Braintree, Zapper and PayPal, as well as payments with Bitcoin. Their loyalty programs include LoyalTree, Pepper, Synergy World, Inc., and LevelUp. As far as accounting is concerned, it is highly convenient that they are integrated with QuickBooks Online. Revel is also integrated with Xero, but this option is not available in the US. Revel uses the gateway payment processor USAePay as well as NewTek and FreedomPay. Other payment processors include Tyro, Mercury Payment Systems, First Data, Moneris, and Adyen among others. Revel offers 24/7 support to all of its customers via a number of channels, including phone, email, and an online form. They also provide remote assistance and on-site support. To reach them by phone, you need to call the help number that shows on the website. Alternatively, you can email support directly at support@revelsystems.com. If you need technical help or have a question, you can submit a request using Revel’s customer support form, which is also available on their website. Their support page has a list with all issues that users have recently reported. On this page, you can submit a support request or simply search for what you need. The company also provides their customers with efficient remote assistance. This allows the user to troubleshoot issues directly without any delay. A certified technician can access your POS remotely and see what the problem is and how they can best fix it. If you insist on receiving on-site technical support, you’ll have to directly contact Revel and arrange a visit of one of their technicians to your office. To see how much the visit is going to cost you, visit support.revelsystems.com. Revel also has a website for training and videos, which they call Revel University. The company's blog updates regularly and it is therefore quite interesting. In addition, they have various social media accounts that you can visit, including Facebook, Instagram, LinkedIn and Twitter. There are hundreds of reviews of Revel POS, which are overwhelmingly positive. Not all of them are positive, however. This is normal for all major companies and, after all, hundreds of merchants have tried Revel POS. We will list the most frequent and recent issues and complaints about the system below. Keep in mind, this is feedback we collected from various sources online, and so these Revel POS system reviews may or may not be accurate. There have been some complaints about Revel POS, in particular regarding the QuickBooks integration. The integration itself isn’t a problem, but the technical support for QuickBooks related issues definitely needs some improvement. “The troubleshooters don’t seem to have a clear understanding of how the integration works. This becomes clear from the by conflicting information I received regarding the inability of Revel to push inventory data to QBO. As we noted above, The initial setup of inventory, menus, and products can be quite lengthy and tedious. This is especially true for businesses with unique processes. Revel is a complex system and its design constantly improves, so that it can fulfill the requirements of businesses of different types and sizes. This is why some technical issues surface from time to time. This complexity means there are going to be a lot of settings and options to make your way through. 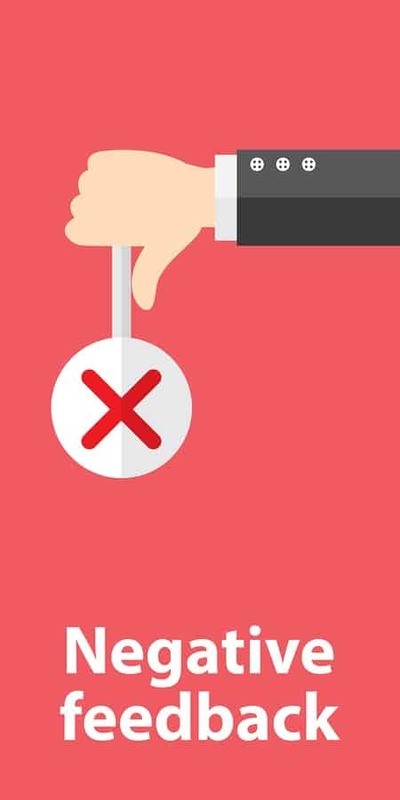 Many of the problems that users have reported are due to the fact that most people do not enough time to become fully familiar with the product before they start using it. You’re going to need enough time to familiarize yourself with the system and the various technical support options that are available. Initially, you will most probably need to make a lot of calls and requests to Revel’s customer support service. Gradually, you will start getting the most out of Revel’s flexible design, which adapts to your specific business needs like a chameleon adapts to its habitat. This is a very common problem, particularly concerning system updates. Some users have complained that the company makes updates without testing them for bugs and glitches. The vast majority of clients do not experience many problems with the system. It can crash now and then, but if it does, it is back, up and running in no time. A window will pop up, asking you to describe what you were doing when the system crashed. The Better Business Bureau has not only accredited, but also given Revel an A+ rating. Most of the positive reviews of this POS system involve the offline mode, versatility, adaptability and constant improvements. Below are some more details. Also known as “Always On” mode, this feature makes it possible to continue working even if your Internet is down or is just plain slow. This feature allows you to continue accepting cash and card payments. It is still relatively unique among POS providers. Revel's elaborate design is the reason why it works well for so many merchants across the US. Its cloud-based functionality is a welcome alternative to the more rigid functionality of computer based POS systems, making it flexible, versatile and easy adaptable to fast-paced businesses whose needs keep changing. This POS system undergoes constant improvements. It did away with its upfront software license fee and expanded and improved its inventory options. The good news is that there is no upfront software license fee. Instead, there is a manageable monthly subscription fee that includes license cost. In the past, there were more complaints about the technical support, most of which were due to it being too slow. Revel has seen some improvement in this field as well. The company reports a customer satisfaction rating of over 93% for hardware, software, and logistical issues. They have recently stepped up their game in this arena even though they haven’t always had a great reputation for technical support. Revel has taken steps to improve customer relations, including the recent redesigning of their suite of training videos. Is Revel POS System Right for Your Business? If you’re a small enterprise, Revel is certainly the type of point of sale system you can scale up with. Depending on the revenue you generate, you may find the monthly subscription fee too high. Many users frown at the sheer effort required to set up many features and settings, some of which they may never need. However, if you’re planning on growing quickly, we would suggest avoiding a transition from a system like ShopKeep to one like Revel, designed for larger businesses. Ultimately, Revel offers everything you need to run your business, if you’ve got the cash to pay for one of the more expensive POS solutions on the market. 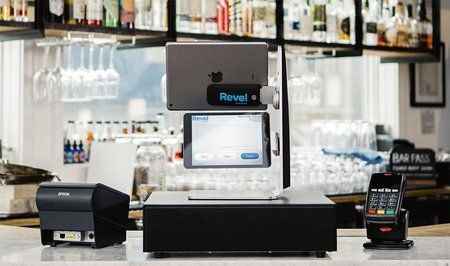 Revel is definitely on par with systems like ERPLY, where cloud-based POS systems for a restaurant or hospitality business are concerned. 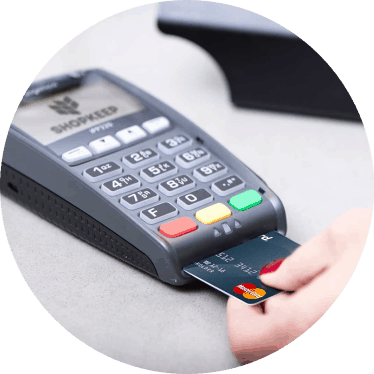 It offers high functionality without being restrictive to people who have no prior experience in using a POS system. No other comparable system has kitchen view, kiosk mode, table listing functions and expedite view. And, Revel has many more features than just those. Regular retail businesses will find that Revel has a great variety of offerings. It is a reliable, solid option. Make sure you check out our other POS system reviews before making a decision.